This weeks challenge is last weeks opposite - rural. I needed a new leash because my last foster dog, Nico, chewed my lovely, strong leather one. I was looking for one that clips around the waist as I have a repetitive strain injury on my right wrist/arm and for walking the dogs - I thought it would help. I decided to drive past the airport to Riverside South and check out a great pet supply store called Chew That. They are wonderful with helping out rescues and they have a full stock of toys, kibble, leashes, beds, raw food (picked up some yummy chicken necks for the pack) and tons more. I was really happy to help support a local business (they just celebrated their 1 year anniversary) and if I was going to buy a new leash from anyone, I would rather give them the money than a chain store. I found the leash I needed and decided to take a back road home, south of the airport. The road was full of washboards so I took it slow and down the road on my left there as this old abandoned barn. I decided this was where I was going to come back and do this weeks theme. After having purchased Zack Arias' new One Light video, feeling inspired, I set out with one of my dogs to get the shot. 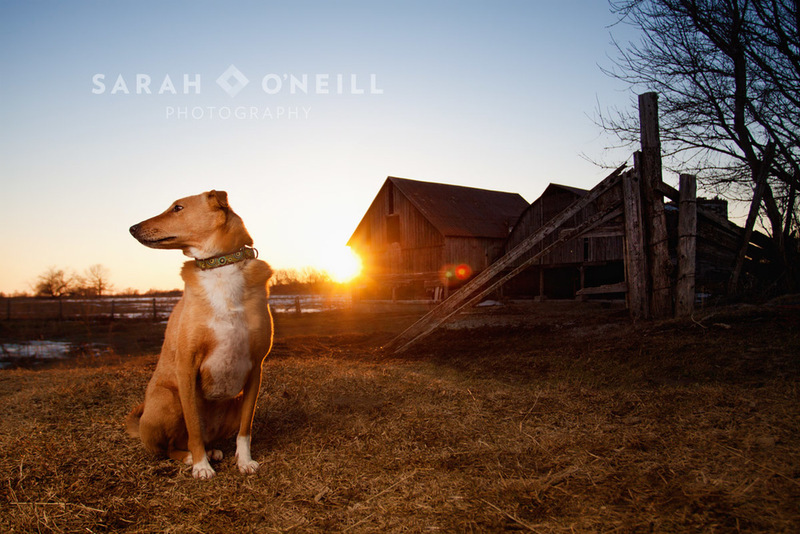 Click over to Blue Amrich Studio in Boston, MA to see her 'rural' post.